Great invitations! Ordered these invitations for numerous events from this company and have been overly satisfied every time! Keep doing your thing CEP. Friendly people at CEP. They are very patient when assisting me and I've always had a pleasure using their services. Very impressed with this company as a whole. The invitations came out perfectly. Thank you so much. Great products, and love that we can support an Eco-friendly lifestyle from purchasing here. Great invitations! Ordered these invitations for numerous events from this company and have been overly satisfied every time! Very impressive invite cards. They really are the definition of Eco-friendly from beginning to end. I just re-ordered for the 4th time. Love how these invitations came out. We customized 15,000 of the tall seed paper invites for all our annual events. Our company is ecstatic that we can support the going green cause. Great customer service with this company. All my questions were answered promptly and efficiently. Our company ordered 10,000 tall seed paper invites for all the potential clients attending our convention. They were a great way to gain exposure and help the earth friendly cause. Durable invite cards the are 100% bio-degradable and earth-friendly. My girlfriends and I love these seed paper invites. We customized them on two different occasions. We liked the idea of these invites being so Eco-friendly, being able to plant an invite card is pretty genius. We are having a large gathering for my parents anniversary. We have family world wide and sent these seed paper invites to everyone invited. When the celebration is over we are all going to plant the invites together as a commemorative gesture. Great customization options with these invites. We customized 15,000 of the tall seed paper invites for all our events coming up over the next year. Set the tone for a memorable event with these eco-friendly seed paper invitations. Custom Earth Promos' Premium Tall Seed Paper Invitations integrate our unique seed paper shapes with 100% recycled paper cardstock of 30% post-consumer content for an eco-friendly promotional product that will boost the value of your brand image and ensure a favorable perception among the invited guests. 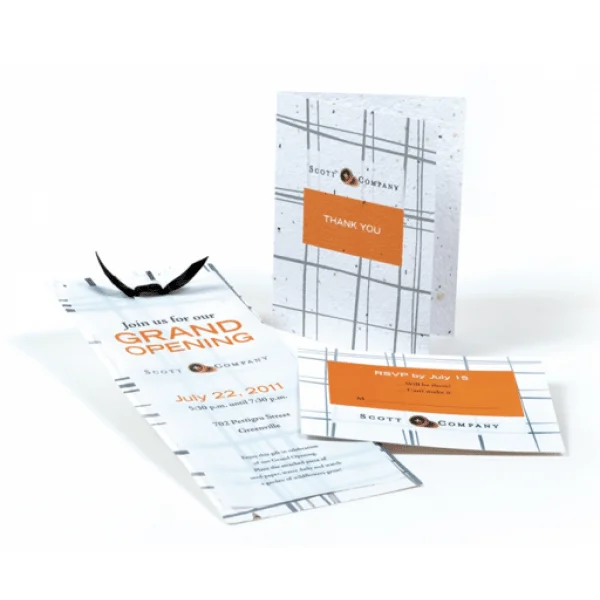 Our seed paper collection is widely customizable, with multiple suites (5) and card formats available to most accurately capture and convey the specific nature of your brand announcement. Custom Earth Promos' seed paper is an innovative, eco-responsible medium. 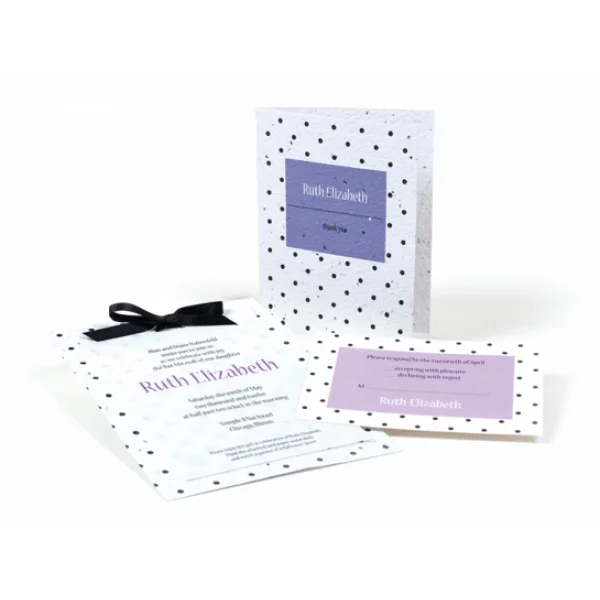 Our premium quality seed paper invitations eliminate eco-impact in every phase of production and is guaranteed to be free of any potentially dangerous chemicals or dyes, ensuring guaranteed safety while maintaining eco-attractive style. Our seed paper is handmade in the USA and invitations are guaranteed to grow into beautiful wildflower gardens when planted and given adequate care. 100% post-consumer recycled material is infused with our highest germination rate wildflower seeds at our 30 kW solar-powered facility. Dyed with all natural, soy-based pigments in a carefully controlled proprietary process that ensures maintained integrity, Custom Earth Promos' seed paper is the best in the industry for both performance and appearance. In CMYK hues, natural pigments are sprayed onto the seed paper to ensure complete coverage while keeping all seeds intact. These premium invitations are a great way to launch green initiatives, promote eco-friendly events or celebrate milestones of sustainable practice. Two-part invitations integrate unique seed paper shapes, printed on 100% recycled paper with 30% post-consumer waste content. With creative dimensions to achieve an out-of-the-box eco-friendly charm, Premium Tall Seed Paper Invitations are an exceptional way to promote an upcoming event, announce an attained eco-friendly goal or celebrate a sustainable milestone. An exceptional branding tool to strengthen the reach of eco-friendly campaigns, our tall seed paper collection coincides with brand marketing in eco-optimization, where environmentally sound strategies secure a visible ROI of brand value, trust, and eco-responsible image. Invest in your brand image, value and long-term profitability by establishing "green" initiatives, like the promise of reduced waste via plantable paper invitations, with a custom design order of seed paper invitations. Consumers are more invested in the social and environmental responsibility a brand exhibits than ever before. Buying behavior is being swayed by eco-responsibility, with more than 15% of consumers reporting a willingness to pay a premium for products from a brand with communicated sustainable initiatives and dedicated waste reduction endeavors. The share value of impact reducing, eco-friendly brands is also rising. Brands established as eco-responsible grew approximately 30% more than their direct competitors, who failed to exhibit notable actions of eco-awareness, in just one year. Secure your future success by spreading the seeds of sustainability with Custom Earth Promos' guaranteed-to-grow seed paper invitations. Seed paper from Custom Earth Promos is the highest quality in the industry and guaranteed to grow when the entire invitation is planted under a thin layer of soil, provided daily water and a little sun. The handmade pulp of 100% post-consumer recycled paper is infused with USDA-approved, non-GMO top performing wildflower seeds. The paper drying and pigmenting process is powered by 30 kW of solar energy in our USA-based facility. Dyed only with all natural, soy-based pigments, our seed paper is the best in the industry in both performance and appearance. The natural pigments are inkjet sprayed onto the seed paper to ensure complete coverage without soaking or oversaturating the paper. This spraying and quick drying technique ensure the seeds are maintained in suspension without disrupting its health. Work directly with a Custom Earth Promos in-house design expert to define the custom attributes of your Premium Tall Seed Paper Invitations. With a wide variety of style options, our sustainable seed paper invitations invite your brand to leave its mark while minimizing its carbon blueprint. Our impact eliminating process is something to be proud of and worthy of celebration. With consumers in high demand of established eco-ethics, use your custom designed order of seed paper invitations to announce the waste reducing brand initiative of using 100% recycled paper for all future event promotions. 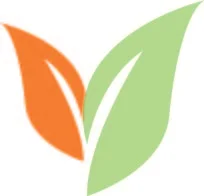 Work this initiative as a "customer promise" and communicate that promise to your customers on the perfect platform, ready-to-plant seed paper that will grow into a beautiful, living reminder of your eco-friendly promise.